The site of this property presented unusual challenges in that the developer, who had renovated the delightful period house, had obliterated the original garden, surrounded the space with a 2 metre high timber fence, surfaced the entire area with gravel apart from a 1.5 metre deep channel around the basement, which he ‘protected’ by a wooden fence, and moved on. When the clients purchased the house they were faced with spaces to front and rear which were devoid of atmosphere and growing potential, and were unable to use the space to the side of the house as it was completely blocked off for safety reasons. The layout of the house means that the gardens are viewed from the first and second floors. The first item on the list was to find a way to cover the deep channel around the house as the clients have small grandchildren who could easily have fallen through the fencing. The wall was in reasonable repair but because of the irregular house walls, we needed something which could be cut to fit. The solution was to make good the top of the wall all the way round and to fit a walkway of GRP mini-mesh marina decking which was installed in sections and cut to fit around the house contours. This allows air to reach the basement while providing the owners with a safe, weatherproof, anti-slip walkway which has also increased the surface area of their garden. Standing in the space was a little like being in a tank – tall fences, high facade, and no planting other than four birch trees in one corner of the rear garden, The owners wanted spaces where they could sit, eat, entertain and above all enjoy the view from the first floor windows of their beautiful home. The front garden was in a similar bare state, with only a few camellia bushes and a strip of paving from the front gate to the steps up to the entrance. The decision was taken to devote a large portion of the budget to laying good quality paving which would allow the owners to start to use the space practically. The front garden is dominated by the formal facade of the house which required a contained and regular response. 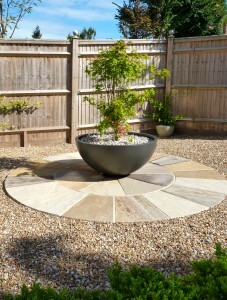 A stone circle was laid in the centre of the larger gravel area which immediately gave it a sense of presence, further enhanced when a very large modern pot containing a multi-stemmed Acer Sango-kaku was added at the centre. A short hedge of Escallonia ‘Donard Red’ was planted along the front wall to give evergreen colour and balance the established camellia, and rows of Hebe Pinguifolia now line the old sandstone path and the driveway edge. We encountered considerable difficulty in planting as there is virtually no topsoil and the subsoil is a thick grey clay filled with large flints. This prevented us from using larger plants and so a serpentine of the same Hebe was planted to add year-round interest to the gravel strip between path and driveway. A new sandstone pathway was added along the front of the house to connect with the side access, surfaced with the decking and secured by new iron gates, and a small terrace created to hold a table and two chairs in a sheltered corner where the owners can enjoy coffee in the morning sunlight. 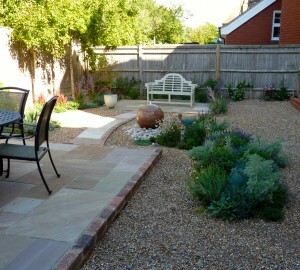 The rear garden holds two rectangular sandstone terraces, linked by a curved pathway, all brick edged. The larger of the terraces is surrounded on two sides by timber sleepers which provide additional seating for entertaining, backed by tall grasses and Japanese anemones, with herbs growing beside the barbecue area. Given that for much of the time, the owners look down on the garden from inside the house rather than being in it, it was important that the lines of the design were strong and that accessories were substantial. A very large sandstone globe, drilled as a water feature, was set in the curve of the path and surrounded by beach cobbles. Subtle uplighting has also been installed to prolong the interest after dark. The owners repainted a Lutyens seat in a muted clay shade which fits the smaller terrace perfectly, and this is surrounded by Perovskia Little Spire, Lavender Munstead, Miscanthus sinensis grasses and Verbena bonariensis which catch the breeze and screen the fence. Planting continued to be difficult with the tricky subsoil. However, an additional birch tree was planted in one cover to balance the existing four in the other, an evergreen Podocarpus macrophyllus forms a focal point in the centre of the back fence, and verticals are supplied by tall grasses and perennials. Bed shapes are organic, reflecting the informal gravel garden style and countering the rectangular shapes of the fence panels, house windows and terraces. These beds hold a mix of drought tolerant plants, many of which are evergreen to ensure winter interest, and attention has been paid to the edges of the beds, using a range of Helianthemums and thymes which will gradually extend and knit together to form a coloured tapestry across the gravel. Textures come from silver leaved Stachys byzantina and Artemisias, spiky Eryngium Jos Ejking, soft Convolvulus Cneorum and a substantial Yucca Gloriosa. Further verticals are supplied by using Acers in ceramic containers within the colour theme. 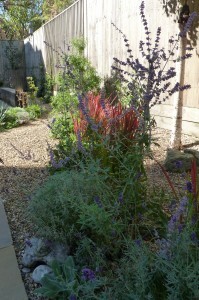 The gravel was replaced on the beds after planting to act as a mulch. The end result is a garden of colours, movement, the sound of water and leaves, light and shade. There are secret corners where small grandsons can hide safely, and as special shells and stones are carried home from the beach nearby they too will add to the very personal atmosphere of this unusual gravel garden.